How do you ensure that all of those items purchased are categorized properly in the requisition and the follow up purchase order? Most suppliers (e.g. Office Depot) adhere to this standard to categorize the products they sell. The benefit of the UNSPSC is that it is a standard ensuring that products purchased from multiple suppliers are consistently categorized. Therefore it would be most beneficial to map the UNSPSC from the punchout catalogs to the ERP product categories. This would ensure uniform categorization of products purchased from multiple vendors without the need for manual coding. Our firm was tasked with setting up an integrated punchout catalog for Office Depot in Business ByDesign for one of our clients. In discovery we noted that there was an extremely high purchase volume from Office Depot spanning many product categories. As stated above, we are limited to setting a single product category for each external Catalog in configuration. Set up an internal product category hierarchy based upon the UNSPSC codes that we knew could be provided to us in the punchout feed. Following is an example of what we imported into the ERP. The Office Depot implementation of the UNSPSC was a total of 1600 product categories. 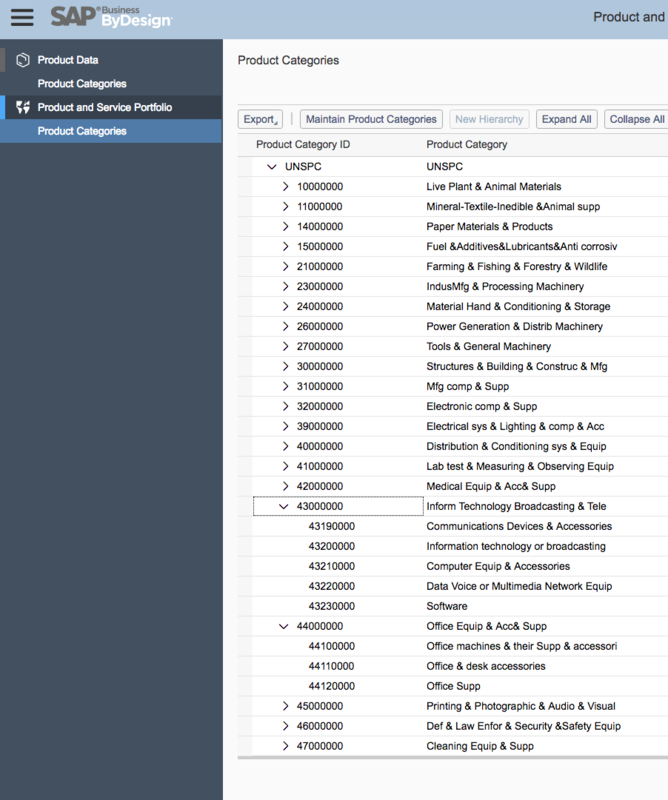 For example, 67 product category codes related to paper products alone ranging from 14111502 through 14121901. However these 67 codes could be contracted to either one code 14000000 - Paper Materials and Products or 2 codes: 14110000- Paper Products and 14120000 - Industrual Use Papers. In essence, using the 2 digit Segment Code would result in a total of 39 Categories and using the 4 digit Family Code would result in 163 Categories.